Personality:Bass is a rather kicked back young man who enjoys the outdoors and nature. He's a warm-hearted man who would be a bit naive. His playful spirit has gotten him into some pretty tough spots but his skills and charm have gotten him out of them aswell. He's a young man of a simple lifestyle living out of the city in the woodlands of the wild. Most of his time is spent running throughout the woods fetching meals for himself while bringing other kills to the market where he gets his living wage. Besides this easy and simply attitude on life he has, Bass is the type of person to always lend a helping hand, and looking for the good in others. It wouldn't be unlike him to give someone two or three chances to change their ways before writing them off as a bad person. Bass isn't really much of leader but he can fill in for a short time if need be, he much rather be on the side of someone who is more of a leader and be used by someone he can place his trust in. All in all, Bass is just a young man looking for the next big hero to join up with and follow them to greatness! Bass enjoys going hunting for days at a time or even for a week out in the woods alone. Bass also really enjoys training, he would like to be known one day as his countires best archer. Dislikes: Bass really doesn't like dishonest people who lie just to get there a way or abuse the trust of others. Bass also don't care for those who break laws and steal from others. Aspirations:Bass aspires to be a great archer and a man his friends and trust and depend on. He strives to be the best person he can be in terms of moral standings and physical fitness. He hopes to one day find someone who he can follow to greatness, and aid them in ways to help them either achieve greatness or at least find a team or group of people with righteous morals leading the way to a better way of life. Phobias/fears:Bass fears becoming a man less than that of what he thinks he could be, he would hate to become a person who is considered morally poor stooping to levels of cruel acts. He fears to lose who he is to gain power or sacrifice his goals and morals to be selfish. As a human, he fears those of the Fanalis race who a bit more aggressive and hot-headed. This isn't to say he is scared of them, but he has seen the power of some of them first hand and fears to die for foolish means by one. Appearance:Bass is a tall human male, with a darker than normal complexion for his skin tone due to being outside a lot. His hair is a reddish color and is of medium length, meaning his bangs hover just over his eyes and cover the tops of his ears. His hues are of a light brown color with black pupils. While his body it tall, it is also filled out meaning his body type fits his height. His muscles are more toned than bulk but some mass is there such as in his back from drawing a most of his life. His shoulders and arms are also bulkier than other parts of his body from the weight of his drawstring. Bass has a flat stomach with slight cuts of abbs but is mostly just flat toned area. His thighs are nice and firm from spending a lot of time climbing and running throughout the woods. His typical style of dress is a collared shirt, brown pants with a quiver on his back and bow in hand. He also wears leather gloves and boots over his hands and feet while a belt holds his cloth trousers in place. History:Originally from the Kou Empire, Bass eventually found himself in Balbadd. As a young child, he and his father would go on fishing trips to Balbadd while his mother and siblings would remain in Kou. It was his duty as the only son of the clan to learn how to hunt and fish to provide for his family once his father was gone or Bass became of age. However, before either could happen his father was one of the men who fought in the civil war of Kou and was killed within the first week of service. His mother feared the same fate would reach her son if they stayed within the country they loved so much and moved to Balbadd. Having spent most of his life in Kou he felt like an outcast amongst those of the Balbadd nationality which eventually lead to him building a home for his family out on the outskirts of the country. Here is where he had been practicing his skill with his bow and providing for his family, it wasn't long until one day where some of the Balbadd bandits came upon his home. He was returning from his hunt when he smelled smoke coming from the direction of his home. Dropping everything besides his bow and arrows he darted off as fast as he could. Arriving at his home he saw something no boy should see, his mother being raped by a gang of men, five in total. It was only for a second that he paused before he put an arrow in the first one, the man currently enjoying his mother. As the arrow went through the man's head his mother would scream as blood covered her. The remaining four men stopped what they were doing to turn towards Bass only to find an arrow coming towards them, he had dropped another one. The three remaining men chased after him, but Bass would run off drawing them into the woods. It was here one by one he would take them out, he knew the landscape he knew where his traps were and he knew animals even the human kind. After putting all three men down he returned home, his mother was bleeding, she had been stabbed for putting up a fight. Soon she would die there in his arms and everything he knew and loved was gone within a few months from each other. Since then he traveled around the world but always returned back to home to pay his respect to his mother and father. Role-Play Sample:On a small trade planet a transport ship was landing. Easing to the ground a slight shaking came from the craft as the landing gear met the landing platform. He Passengers within the vessel rocks a bit before exiting as soon as the door opened. This wasn't a fancy ship most passengers were standing and the seats that were available taken by women and old people, even scum had standards in some cases, or rather this one did. A Short-horned Changeling would be seen all the way in the back of the transport when the doors opened and people started to shuffle on out the changeling remained where he was. His hues scanned the transport ship looking for anything of value left, there was nothing. Lowering his head in defeat he started to walk off the craft, his body was covered in black clothing covering most of his natural body armor. Zero Ika started to walk down the exit ramp looking to gain some money somehow, it wasn't long that the Order 66 command had been issued. His Emperor was a great and powerful man, no one made his rattle in feat more than him. Even when the two were in the same room he would feel as if he was going to die. Not that they were in the same room often, only twice since he joined the faction. Slipping his hands into his black pants he started to walk down the street. This particular planet was too far from most suns to have a bright sky mostly leaving the life here to be in night lifestyle, partying, gambling, things of this nature took place more often than not. A Perfect Place for a small timer like himself. With the change of power throughout the universe things were changing into a more chaotic setting, they were told to keep an eye out for Galatic Patrollers and take them down if possible. Zero feared his powers weren't up to snuff to be able to do such a thing, however he would try if the proper chance arose. Zero sighed as the dark skies start to bring darker clouds adding to the shadows between the large skyscrapers builds that towered over the people. This planet's trades allowed it to be rich having flying vehicles all through out the city and structures no smaller than 20,000 feet tall. Perhaps he could find himself some easy coin in one of the casinos here or maybe not, he wasn't that lucky when it came to gambling but ti was fun. In any case he had just came upon his first victim, a drunk Xeno wabbling amongst the streets blabbing about what a night he had. The dark lips of the changeling would cover upwards as a grin would cover his face. "Hmm, and so it starts." He stated as he started to follow the man waiting for his chance to strike like a deadly stone fish hidden on the ocean floor. Trait Description: Through training and hunting the user's eyes are better than normal. Trait Effect: The user is able to see speeds of even the fastest beast within the land, allowing the user to see speeds that would be normally blurring to others while granting a clearer sight to the user. This effect has a 10 meter range, everything outside of 10 meters is hazy, but still visible. Trait Description: The character possesses a human body with all its faults and advantages. An adaptable, albeit fragile, race which has the highest affinity for magoi. Player can deal D-tier damage with their strength alone and move at average speeds. Starts out with four starter trait points, rather than two. Earn an additional 3,000 huang for completing jobs. Earn a single custom Magic Weapon for your Primary Class once you reach B-rank. Ranger is a class which revolves around the usage of long-ranged weapons and hunting skills. Their abilities revolve around marksmanship, concealment, and tracking. Outside of their abilities they have a limited amount of ammunition for their given weapons, producing long-ranged attacks with no stamina cost. D-Tier: May bring up to 1 ranged weapon and 1 hunting knife into a thread. 5 free ammunition outside of abilities. C-Tier and below abilities can be used. C-Tier: May bring up to 1 ranged weapon and 1 hunting knife into a thread. 10 free ammunition outside of abilities. B-Tier and below abilities can be used. B-Tier: May bring up to 2 ranged weapons and 1 hunting knife into a thread. 15 free ammunition outside of abilities for your ranged weapons. A-Tier and below abilities can be used. A-Tier: May bring up to 3 ranged weapon and 1 hunting knife into a thread. 20 free ammunition outside of abilities for your ranged weapons. A-Tier and below abilities can be used. Ω-Tier: May bring up to 3 ranged weapon and 1 hunting knife into a thread. 25 free ammunition outside of abilities for your ranged weapons. A ranger is skilled in the art of tracking as well as surviving in the wild. They may create abilities focused on these skills such as increasing their senses or making camouflage. They are capable of making use of their surroundings and are most effective in forests or other remote locations in the middle of nature where poisonous plants or local wildlife can be used to their advantage. Ammunition damage is based off the tier of the Ranged Weapon being used to launch it. *Important Note - All Ranger abilities that use a Ranged Weapon must be Long Range. 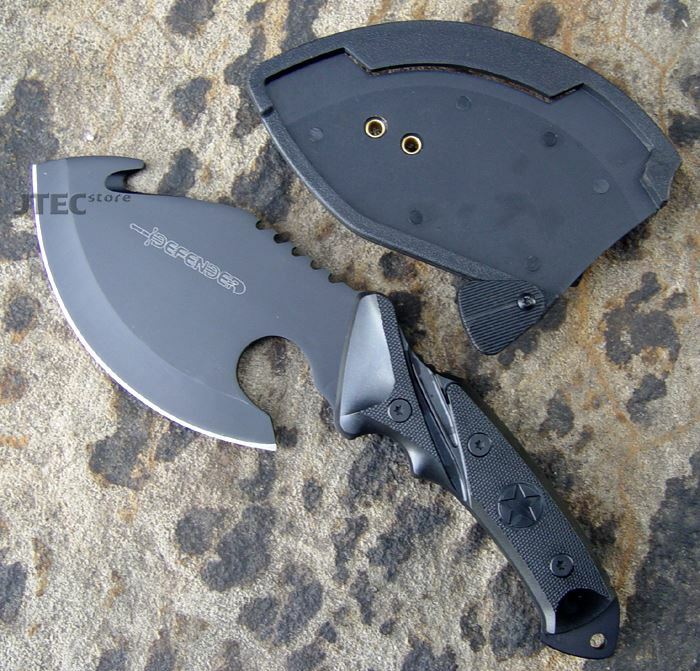 Appearance: An Almost oval blade attached to a black carbon fiber handle, the blade also has a gutting hook on the top of the blade near the tip. Ridged blades on the back of the blade near the hand used for sawing and the front of the blade is sharped enough to slice through even the roughest of furs for skinning within seconds of a skilled skinner. The blade is 2.54 in length while the handle is slightly long at 3 cm. the Width of the height of the blade (the blade to the ridge of the back) is 2 cm. The width of the blade is about 1 cm as the handle slightly bigger at 1.5 cm. Appearance: This dagger is 32cm in length total and has a very slight curvature to its blade. The inside edge of the curve is a sharp blade, but the other edge is actually a smooth dull surface upon which the magic circle is engraved. Bounding Slash - Feeding magoi into the dagger causes the blunt side of the dagger to become shrouded in strength magic. 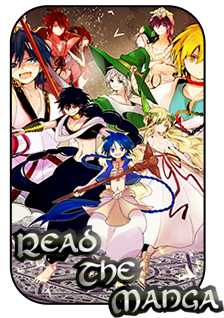 The magic will trail behind the users next slash creating a trail of strength magic up to 1m in length. The next thing to impact the trail of strength magic will be pushed in the direction of the face that was struck up to 10m away. If the person or object bounded impacts an obstacle before traveling at least 5m, B-tier damage is dealt. The trails linger for 3 posts and sustaining this function will allow for an additional slash. 10 magoi to activate | 5 magoi to sustain. 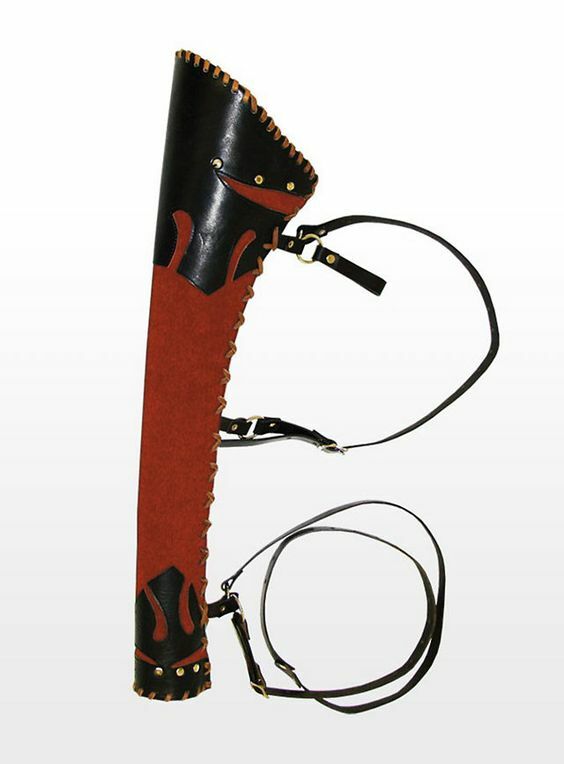 Description: A red and black dyed leather quiver used to hold the ammo of the ranged weapons used by Bass. It's 2.8 meters long, and 1.5 meters wide, giving it enough length and width to hold the long ammo used by Bass's bow. Requirements/Drawbacks:User must be using a long-range weapon which uses a string system. User Must Fit the ammo on the Draw String/Chamber. Placing the ammo onto the weapon the user launches one projectile at their target for at least 10-20meters away. Ammo used is based upon the ranged weapon. The Projectile rockets for its target in a straight line, the head of the projectile is equipped with a BLUNT point, meaning the head of the projectile is rounded and doesn't stab or penetrate. The size and shape of the projectile are based on the Range weapon being used. This ability has D tier base damage, however, scales with the weapon used. Requirements/Drawbacks:Must draw and fix ammo onto the weapon and have a line of sight on target. Bass fires ammo attached with a spearhead and rope. The Spearhead is about .5 meters long and .2 meters wide while being .1 meters in thickness. The rope is of steel, giving it a black color and a length of 20 Meters. This would be limited to things that have less durablility than metals such as steel and iron. Requirements/Drawbacks:The User much draw the ammo from their quiver and load the ammo to fire. Must have a line of sight. Scaling: Damage: increases damage per 10 Stamina invested Capping at A tier. Bass fires ammo out that heads directly for an incoming attack and hits it head on either knocking it it away from Bass or canceling it out with Kinetic energy. This ability is limited block same Tier or lower abilities. Requirements/Drawbacks: Must draw and fix ammo onto weapon before firing. Scaling: AoE: per 10 stamina the area of effect is increased by 5m. Attached to the ammo used by Bass is a small square blunt surface with a striker like a match that rests on a small black box filled with flare like gunpowder. Bass strikes the ammo on a surface like a wall or the ground igniting the striker before shooting the ammo up to 15 meters away. Upon impact, the striker folds in causing an explosion of a bright red light that blinds all who are within 10 meters of its light. This blinding effect last one post until the effect wears off. Requirements/Drawbacks:User must have a line of sight on target and The targets must be within 5 meters of each other. Description: The user's fires two arrows at the same at aiming for two targets at once. Using his bow Bass fires 2 arrows at once at 2 different targets. Each Arrow deals at weapon damage while traveling up to 20 meters. This means there is a single arrow for each target. Each arrow does d tier damage.